New Tattoo Rules and the Marines – Run For Your Life! With the release of a new set of guidelines governing tattoos (just this past week), the U.S. Marines have changed the rules. And things are about to change – big time. 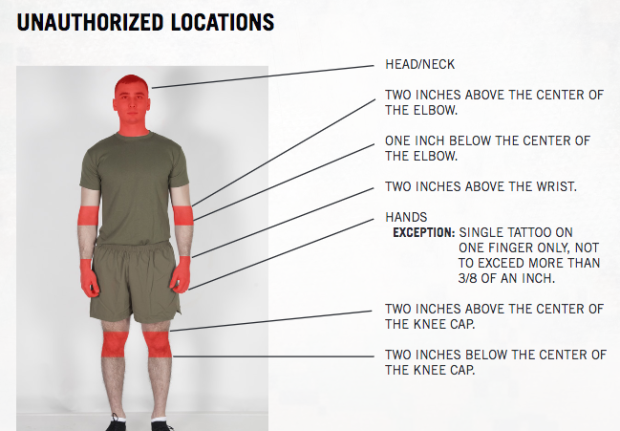 The U.S. Marine Corps’ new tattoo policy spans 32 pages, complete with a glossary and rules down to the inch, writes Nick Faris. Robert Neller is the commanding general of the United States Marine Corps. He has led American forces into Panama, Somalia and Iraq over his four decades of service. Last week, he took steps to address the latest scourge facing his troops: Tattoos. No longer will Marines be allowed to run rampant with body art — not under a 32-page set of regulations authorized by Neller on June 2. The bulletin lays out the Marine Corps’ tattoo policy in exacting detail, banning everything from tattoos above the baseline of the neck to those that run too close to elbows, wrists and knees. It also comes with a glossary page — defining the elbow, wrist bone, knee and other terms — and a 14-page appendix of photos explaining what is and isn’t OK. In some ways, the updated policy is actually more lenient than past versions. 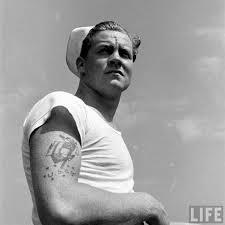 Marines are now allowed to have an “unlimited” amount of tattoos on parts of the body covered by their uniform. Officers, though, are restricted to no more than four tattoos on exposed skin.